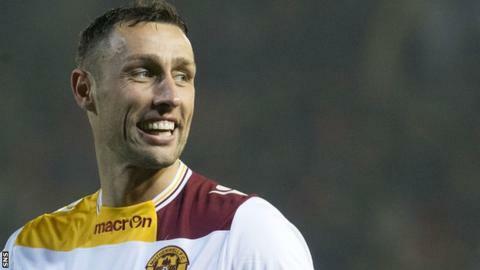 Motherwell expect Scott McDonald to decide within 48 hours whether to sign a deal with the Premiership outfit, according to manager Ian Baraclough. The 31-year-old striker spent the second half of last season at Fir Park and helped Well avoid relegation. "We're hoping that something will materialise in the next 24 to 48 hours," Baraclough told BBC Scotland. "I know that he enjoyed his three or four months he was here and wants more of it." McDonald, who won 26 caps for Australia, returned to Fir Park after being released by Millwall and scored five times in 13 appearances before the Steelmen secured their top flight status by beating Rangers in the play-off final. "To have someone like Scott, we brought him in last season and he played his part in us staying up," said Baraclough. "He was an integral piece of the jigsaw and it'd be good to have him around again: someone who knows the football club and knows what's required and expected of him. "He's had plenty to think about but the conversations have been positive and, hopefully, we'll have an answer within 48 hours." Speaking last month, McDonald said there was "a huge chance" he would return to Well. "We've always loved living in Scotland, me and my family, and I still have my house up there as well," he said.